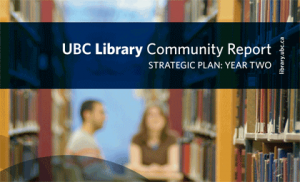 UBC Library’s Community Reports offered updates on the implementation of the Library’s Strategic Plan from 2010-2015. Our fifth annual Community Report provides an update on our transformation in discovery, learning, collaboration and research. Find out how a special training program helps international students hone their tech know-how for the 21st-century classroom. Discover how UBC Library’s partnership with Better World Books helps support literacy initiatives – and bypasses the landfill. 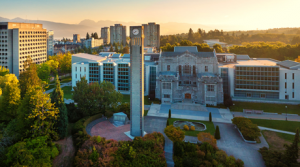 At UBC, the future of knowledge is opening up – and the Library is playing a key role to bolster the University’s research and share its efforts. 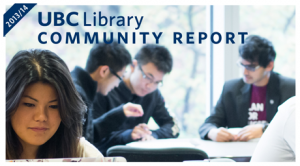 UBC Library preserves its physical and digital collections for current and future generations of scholars, researchers, students and lifelong learners. 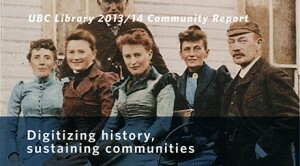 Researchers around the world have valuable access to Okanagan history, thanks to a digitization project involving UBC Library and the Okanagan Historical Society.